Just like on the night market in Laos, vendors will set up their stalls at our venue at Wallace Hall. Vendors come from all over the United States and feature Hmong and Lao-inspired items, such as such as Peace bomb jewelry, embroidered bags and ties, non-perishable foods like Lao beef jerky and Lao coffee beans, and ethnic handicrafts. Fifty percent of proceeds from evening sales will be donated to Legacies of War. Please take a look at our past vendors and write us if you or someone you know would like to become a vendor! ARTICLE 22 brings ethical jewelry to reality with the #peacebomb collection made by local Laotian artisans. Turn fashion into impact. Artisans of Naphia return to their bomb littered village in 1974 upon the close of the Vietnam War to find bombs, exploded and unexploded, and a crashed jet plan. One man learns to melt the war scrap into spoons. Since ARTICLE 22 began working with the village in 2009, 12 families grew into 15 families, husbands and wives that make Peacebomb jewelry. They work part time and earn at least 5x the local hourly minimum wage, providing them with the disposable income for books, school, fuel,and medicine that their subsistence farming livelihoods cannot. Artisans are agents of change, healing their land, making it safe to play and grow rice,as the sale of each Peacebomb helps clear UXO from the land. The simplest bracelet helps clear 3m2. Tony lives between the traditional and modern worlds, honoring both. His vision is shaped by his culture and drive to share it with the world. Each piece reflects his story, Lao heritage, and passion to create a legacy for future generations to enjoy.Tony Innouvong's designs are inspired by the fusion of traditional compositions and modern men's accessories. The result is a hybrid of old world patterns into everyday fashion that people from all around can incorporate into their look. TI's unique products are exclusively designed and handmade in the USA. Khao Laam is a family-owned business based in Atlanta, Georgia with the mission to provide traditional and delicious hand-made Khao Laam to Asian born Americans throughout the US. Khao Laam is a rice dessert made of sticky rice with red beans, sugar, grated coconut and coconut milk roasted in specially-prepared bamboo sections of different diameters and lengths. All bamboo is locally sourced with several acres of land in the North of Georgia mountains. Everything is done by hand, including the peeling process of outer layers of bamboo as traditionally done in Laos. Are you looking for an incredible opportunity to sell your work? If so, apply to be one of our featured vendors at #LaoNow 2016. 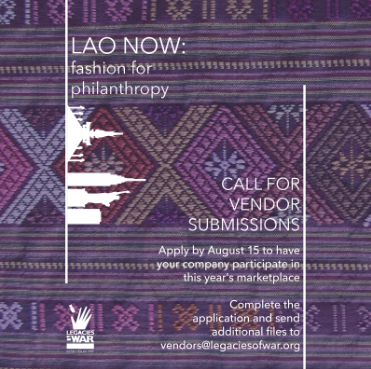 We are looking for Lao companies or Lao inspired work to be a part of our marketplace at the Fashion Meets Philanthropy. Half of the proceeds will be donated as part of the fundraiser. Complete our application online form here by August 30 and send any additional materials to vendors@legaciesofwar.com. We look forward to having you on board!